Number of patients who had palliation from esophageal bypass surgery and stents. Survival of patients undergoing planned (n = 28) and unplanned (n = 10) esophageal bypass, 1991 through 1998. Hypothesis With the introduction of safe, effective nonoperative alternatives, bypass surgery for unresectable esophageal cancer is infrequently performed, but it has a limited role in palliation of esophageal cancer that needs to be defined. Setting Department of Surgery at Queen Mary Hospital in Hong Kong. Patients Patients who had unresectable esophageal cancer and underwent bypass surgery between January 1, 1991, and December 31, 1998. Intervention Bypass procedures were performed using a gastric or colonic conduit to the neck. Main Outcome Measures Morbidity and mortality and quality of palliation. Results Thirty-eight patients underwent retrosternal bypass to the neck using a gastric (n = 27) or colonic (n = 11) conduit. Ten patients (26%) underwent unplanned bypass at the time of exploration for resection because of unexpected findings of T4 disease (n = 2) or technical difficulties in addition to advanced disease (n = 8). Between 1991 and 1994, 1 of 26 bypasses was unplanned and the hospital mortality was 42% (11/26), while between 1995 and 1998, 9 of 12 bypasses were unplanned and the hospital mortality was 8% (1/12). There were 12 hospital deaths in the planned bypass group (n = 28) and none in the unplanned bypass (n = 10) group (43% vs 0%, P = .01). The median survival in patients who underwent unplanned bypass was 6.9 months, compared with 1.9 months in patients who underwent planned bypass (P = .004). All patients were discharged from the hospital on at least a semisolid diet. Conclusions The Kirschner operation is largely obsolete as a planned procedure because of high morbidity and mortality. Bypass surgery, however, is a reasonable option as an unplanned procedure when resection is precluded at the time of exploration because of unexpected adverse operative findings. PALLIATION OF symptoms is the primary aim of treatment in patients with unresectable esophageal cancer and requires individualization of treatment. Choosing the best method of palliation for a particular patient requires knowledge of the efficacy and complications of available treatment modalities, as well as consideration of the individual patient's performance status. 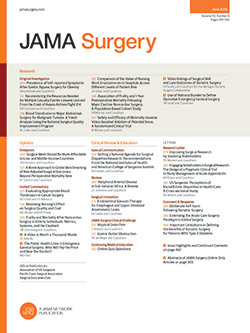 During the past decade, an increasing number of nonoperative modalities have become available for the palliation of patients with advanced-stage obstructive disease.8 The indications for bypass surgery have diminished in recent years, particularly with the advent of self-expanding metallic stents and effective chemoradiation therapy. The objectives of the present study were to analyze our recent results with esophageal bypass and to determine the role for this operation in an era of changing indications. In the Division of Esophageal Surgery, Department of Surgery, University of Hong Kong Medical Centre, Queen Mary Hospital, 768 patients with esophageal cancer were managed between January 1, 1991, and December 31, 1998. Fifty-four patients (7%) were at the preterminal stage and received supportive care only; 178 patients (23%) were palliated by nonoperative treatment modalities. Surgical resection was carried out in 487 patients (63%), while 11 (1%) underwent surgical exploration alone, without resection or bypass procedures. In 6 of these patients, carcinomatosis was found at the time of laparotomy, and a further procedure was deemed unjustified. In the other 5 patients, exploration of the cervical esophagus showed that the tumor had extended to the cervical region and no suitable length of esophagus was available for anastomosis (4 of these patients also had airway infiltration by tumor). Another 38 patients (5%) underwent esophageal bypass and were the subject of this study. Patient data and follow-up records were analyzed from a prospective esophageal cancer database. Hospital records were reviewed when additional information was required. Patients who presented with esophageal cancer underwent the following investigations for staging: endoscopy and bronchoscopy, barium swallow study, computed tomographic scan of the thorax and abdomen, and, from 1995 onward, endoscopic ultrasonography. Since 1998, all patients with gastroesophageal junction tumors have undergone further staging by laparoscopy and laparoscopic ultrasonography. The treatment philosophy at the University of Hong Kong Medical Centre is biased toward resection of esophageal cancer for cure and palliation, because it is believed that successful surgical resection offers the best quality of palliation, if not a cure. This is underscored by our high resection rate (63% [487/768]). The transthoracic approach with 2-field lymphadenectomy is preferred over the transhiatal approach, with the latter generally reserved for patients with poor cardiopulmonary reserve. The transhiatal approach is not used in patients with advanced disease and for tumors located in the middle third of the esophagus because of the increased risks involved. Patients with unresectable disease who underwent a bypass operation fell into 2 groups. The first group (planned bypass) consisted of patients with unresectable tumor diagnosed on preoperative investigations. This included patients with tracheobronchial tree involvement diagnosed on bronchoscopy or in whom there was clear evidence of T4 disease, such as aortic involvement, on endoscopic ultrasonography. Some patients who underwent a bypass operation had a combination of bulky, extensive intrathoracic disease, and their general physical status precluded a thoracotomy. The second group (unplanned bypass) included patients who underwent exploration with intent for resection, but the tumor was unresectable; therefore, a bypass was performed. This latter group also included patients who had dense lung adhesions or a fibrous, unyielding rib cage that precluded surgical access for tumor resection. For some of these patients, other adverse intraoperative events occurred that led to a change of operative strategy to that of a bypass. The technique of bypass has been described.9 All bypasses were performed via the retrosternal route, and the stomach was the preferred conduit for reconstruction. Our preference has been to drain the distal esophagus to a jejunal loop, but in difficult cases, we have left the esophagus excluded. Previous experience with bypass surgery at the University of Hong Kong Medical Centre has taught us that, while most patients tolerate an excluded esophagus uneventfully, occasionally, it is found at follow-up to be associated with complications related to proximal and distal "blow-out" and airway compression. The outcome of bypass surgery was analyzed with regard to morbidity and mortality, survival, and quality of palliation. Postoperative complications were categorized as medical or surgical. Medical complications that were evaluated included cardiac (myocardial infarction and heart failure), pulmonary (bronchopneumonia, aspiration pneumonia, and respiratory failure), renal failure, hepatic failure, and stroke. Surgical complications included anastomotic leakage, gangrene of the conduit, hemorrhage, intra-abdominal sepsis, and gastric outlet obstruction. A 30-day mortality was defined as death within 30 days of esophageal resection, while any death in the hospital after surgery was recorded as a hospital death. After recovery from surgery at Queen Mary Hospital, it was not uncommon for patients to convalesce at an off-site medical facility for socioeconomic reasons. Any death that occurred during convalescence, including those caused by progression of malignant disease, was recorded as a hospital death. Palliation was assessed with regard to the quality of restoration of swallowing. Statistical analyses included χ2 test, Fisher exact test, and t test, where appropriate. Survival time was determined from the date of surgery to the date of the last follow-up or death. Survival rates were estimated by the Kaplan-Meier method, and log-rank analysis was used to compare survival distributions. Statistical significance was set at the 5% level. All statistical analyses were performed using the SPSS, version 9.0 statistical package (SPSS Inc, Chicago, Ill). Thirty-eight patients underwent bypass (mean age, 66 years; 33 male [87%]). All patients had dysphagia at presentation; 16 (42%) were tolerating a soft diet, 17 (45%) could only tolerate liquids, and 5 (13%) had complete obstruction. Three patients also presented with hematemesis, and 1 patient presented with hemoptysis. Histologic findings were squamous carcinoma and adenocarcinoma in 37 patients and 1 patient, respectively. Tumors were located at various sites of the esophagus: the upper third in 3 patients (8%), middle third in 30 patients (79%), and lower third in 5 patients (13%). Eleven patients (29%) had histologic evidence of tracheobronchial invasion, and 1 patient had clinical and radiological evidence of a tracheoesophageal fistula. The extent of disease was stage III in 22 patients (58%), stage IVa in 9 patients (24%), and stage IVb in 7 patients (18%). The demographics of the 38 patients, divided into planned and unplanned groups, are given in Table 1. There were 28 patients (74%) who had planned bypass, while 10 (26%) had unplanned bypass. Two of these patients who underwent unplanned bypass were found to have unresectable T4 disease at exploration. In the other 8 patients, the decision for bypass was based on the operative findings of advanced disease and 1 or more of the following technical difficulties: dense pleural adhesions (n = 4), persistent hypoxemia on single-lung ventilation (n = 3), and evidence of portal hypertension (n = 1). In 6 of these patients, the planned procedure was a 3-phase esophagectomy. The decision for bypass was made at the time of thoracotomy in 4 patients and thoracoscopy in 2. In 4 other patients, the planned operation was a Lewis-Tanner procedure, and the decision for bypass was made at the time of laparotomy. Although stage distributions were not statistically different between the 2 groups, patients who underwent a planned bypass were significantly more likely, compared with the unplanned bypass group, to have tracheobronchial tree invasion (P = .03) (Table 1). The planned bypass group included all patients with stage IVb disease, 3 of whom also had tracheobronchial tree invasion. All bypasses were retrosternal with a hand-sewn anastomosis to the divided cervical esophagus in the left neck. Gastric and colonic conduits were used in 27 patients (71%) and 11 patients (29%), respectively. Reasons for not using a gastric conduit included a history of previous gastric surgery (2 patients), a short contracted stomach (3 patients), and advanced celiac nodal disease involving the stomach (6 patients). The esophagus was not drained (and was therefore excluded) in 11 patients (29%), while in 27 patients (71%), the esophageal remnant was drained to a jejunal loop. One patient required a splenectomy to control hemorrhage from a splenic injury. During the study, there was a gradual decline in the number of bypass procedures performed. This paralleled the increasing use of self-expanding metallic stents (Figure 1). Chemoradiation therapy has been offered to patients for palliation since 1995. Between 1991 and 1994 and between 1995 and 1998, the number of bypasses was 26 and 12, respectively. There were more unplanned than planned bypasses performed during the periods (1/26 vs 9/12, P<.001) (Table 1). The incidence of postoperative complications was not statistically different between patients who underwent planned vs unplanned bypass (Table 2). Major respiratory complications occurred in 14 patients (37%). Ten of the 11 patients who developed respiratory failure, however, were in the planned bypass group. There were 2 incidences of anastomotic leakage in the planned bypass group, which resulted in 1 patient requiring operative drainage, while the other patient required percutaneous drainage of a retrosternal and subphrenic abscess. The 1 patient with an anastomotic leak in the unplanned bypass group was treated conservatively. There were no complications related to an excluded esophagus. The 30-day mortality was 18% (7/38), and the overall in-hospital mortality was 32% (12/38). All the hospital deaths were in the planned bypass group (43% [12/28]) (P = .01). The causes of death included major pulmonary complications (7 patients), anastomotic leak (1 patient), and tumor progression (4 patients). Eleven of the 12 deaths occurred between 1991 and 1994 (42% [11/26]), while only 1 patient died between 1995 and 1998 (8% [1/12]). Twenty-six patients (68%) were discharged from the hospital. At the time of discharge, 14 patients were able to tolerate a solid diet and 12 were able to tolerate a semisolid diet. Oral intake was maintained in these patients for a median of 18 weeks (range, 3-96 weeks). Six of the 12 patients who were not discharged from the hospital were receiving oral intake before death: 1 was on a solid diet, 2 were on a semisolid diet, and 3 were on a liquid diet. The median survival of all patients who underwent bypass was 3.6 months (range, 0.1-22.9 months). The median survival for patients who underwent unplanned bypass was 6.9 months, compared with 1.9 months for the planned bypass group (P = .004) (Figure 2). When hospital deaths were excluded in the planned group, however, median survival was 5.1 months, which was not significantly different from that of the unplanned group (P = .06). The role of bypass surgery in the palliation of patients with unresectable esophageal cancer has been difficult to define. However, reported mortality after bypass surgery has been generally high, ranging from 10% to 40%, and highlights the difficulty of operating on high-risk patients with advanced disease. Meunier et al6 studied 32 patients who underwent bypass, of whom 20 had a tracheobronchial fistula, and reported a hospital mortality of 34%. Segalin et al4 described a series of 49 patients, of whom 17 had stage IV disease and 25 had tracheobronchial invasion. Their reported postoperative morbidity and hospital mortality were 57% and 20.4%, respectively. The median survival was 6.2 months. In the present study, the overall morbidity and mortality was high—32% (12/38) of patients died in the hospital. Deaths, however, only occurred in the planned bypass group, and 11 of the 12 patients who succumbed were operated on in the earlier half of the study (1991-1994). Improvements in surgical and perioperative care probably contributed to the reduction in mortality in the second half of the study (1995-1998). However, the better result seen during this period was more likely due to improved patient selection. Unplanned bypass accounted for 75% (9/12) of patients in the latter half of the study, and hospital mortality was reduced from 42% (11/26) to 8% (1/12). In this subgroup, patients were selected on the basis that they were considered suitable for potential resection; the change of strategy to one of bypass did not appear to adversely affect outcome. The high mortality in the planned bypass group likely reflects more advanced-stage disease and poorer performance status of these patients. Correlating disease stage with mortality, one study10 divided 124 patients who underwent bypass into 3 groups according to the extent of disease and showed that hospital mortality in the group with localized disease was 0%. Hospital mortality was 7.5% and 18% in the groups with more advanced disease. One study6 showed that hospital mortality in patients with and without tracheoesophageal fistula was 45% and 16.6%, respectively. A 30-day mortality of 25% was shown in another study11 of 28 patients with malignant tracheoesophageal fistula. In the present series, tracheobronchial invasion or stage IVb disease was evident in 55% (21/38) of patients. Tracheobronchial invasion was associated with a 55% (6/11) mortality. The high hospital mortality in the planned bypass group mitigated any benefit derived in terms of palliation, and the preferred treatment of these patients should be by nonoperative means, such as placement of metallic stents. These results emphasize the importance of patient selection. At the University of Hong Kong Medical Centre, the preference is to treat esophageal cancer by surgical resection, whether for cure or palliation; the hospital mortality is less than 5% with this approach.12 The selection criterion for bypass in the present series was therefore strictly surgical unresectability. Patients in the unplanned bypass group had advanced disease, which, together with technical difficulties, made surgical resection by a transthoracic or transhiatal approach a prohibitive risk. Our overall series of patients with esophageal cancer includes a predominance of middle-third tumors, in contrast to Western series that include a predominance of distal-third tumors.13 Despite advances in preoperative staging techniques, determination of resectability for middle-third tumors remains a challenging decision. The esophageal surgeon is occasionally confronted with the dilemma of intraoperative unresectability and should be familiar with the technique of esophageal bypass as a therapeutic option. At our institution, a change in treatment preference is evident—the number of bypass procedures has decreased over the years; planned bypasses have been almost abandoned. Other safer and effective nonoperative options have been introduced and refined for the palliation of patients with advanced-stage disease, such as insertion of self-expanding metallic esophageal stents or chemoradiation therapy. The development of self-expanding metallic stents during the past decade has significantly affected the choice of palliative options for these patients.18,19 These stents have the advantages of high success rates, immediate palliation, and low morbidity. They are also effective in the management of tracheoesophageal fistulas.20 Compared with nonoperative treatments, long-term cost-effectiveness may be better because of the reduced need for reintervention and a shorter hospital stay.21 Even so, in a recent study22 of long-term results in 100 patients with metallic stents, reintervention was required in almost one third of patients. When a tumor is found to be unresectable at the time of exploration, 2 treatment strategies exist: (1) proceed with a bypass or (2) abandon other procedures and insert an esophageal stent for palliation. Radiotherapy and chemotherapy can be given postoperatively in either case, although their value is uncertain. Both treatment options have advantages and disadvantages. A successful bypass procedure can ensure adequate relief from dysphagia, which can usually last until the patient's demise; the disadvantages are the associated potential morbidities and mortality. For stenting, abandoning further surgical procedures is safe, but the quality of dysphagia relief may be inferior to that of bypass surgery. Reintervention may be required. What the present study could not answer is whether quality of life of patients who underwent bypass procedures is better than that of patients who had nonoperative treatment. The quality of palliation was estimated to be good or excellent in 71% of patients with bypass in one study4; another10 demonstrated that 82% of patients had complete and lasting relief from dysphagia. In our patients who were discharged, 54% (14/26) were tolerating a solid diet, which was maintained for a median of 18 weeks, and all patients who were discharged were tolerating at least a semisolid diet. These data, although satisfactory, cannot be directly compared with those of other patients who did not have bypass for palliation, because patient selection was different and eating ability was only one aspect of the overall quality-of-life assessment. In summary, in this series of bypass procedures from an experienced esophageal surgery center, we have shown that planned bypass is associated with unacceptable morbidity and mortality. We have abandoned this approach in favor of newer and safer nonsurgical modalities. Our data suggest, however, that bypass surgery performed as an unplanned procedure may be a useful option in patients in whom resection is precluded at the time of exploration because of unexpected technical difficulties or advanced disease. There was no operative mortality in the unplanned bypass group. As improvements in staging modalities lead to better patient selection, however, it is anticipated that this indication will continue to decline. Validated assessments of quality of life and cost-benefit analyses should be included in future studies, especially when different modalities of palliative treatments are compared. Accepted for publication May 19, 2002. Corresponding author and reprints: John Wong, PhD, FRACS, Division of Esophageal Surgery, Department of Surgery, University of Hong Kong Medical Centre, Queen Mary Hospital, 102 Pokfulam Rd, Hong Kong (e-mail: jwong@hku.hk).